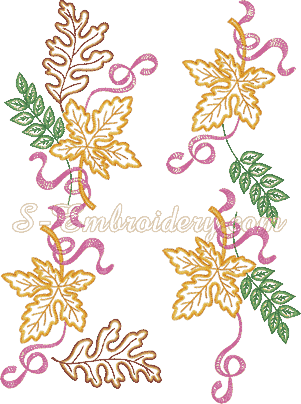 A set of 16 autumn leaves classic machine embroidery designs. You receive 16 machine embroidery files in one of the supported formats, as well as color chart in PDF format. The largest design in the set measures 4.75 x 7.06 inches (121 x 179.4 mm) and has 14,339 stitches, and the smaller one is 3.06 x 3.20 inches (78 x 81 mm) with 3,089 stitches. Number of colors is 3 to 10.